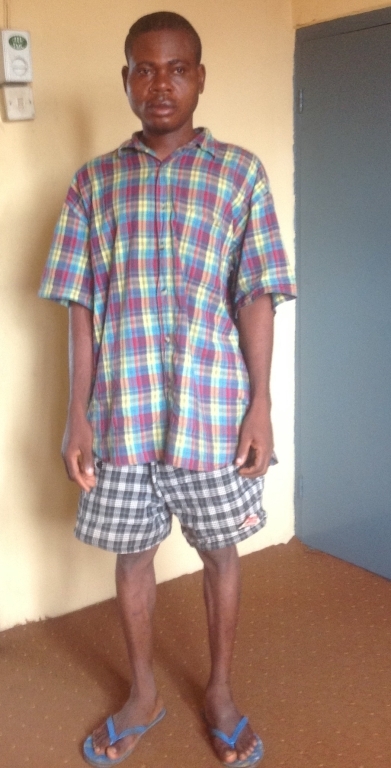 Emmanuel Ubaji, a petty trader residing in Akure, hails from Ebonyi State, South East of Nigeria. Like many people living below the poverty line in most parts of the country, Ubaji struggles daily to eke out a living from selling used bottles and other petty things around him. In spite of his condition, he still has the burden of fending for his mother in the village. On November, 27, 2014, Mr. Ubaji began a journey necessitated by a distress call from the village that his mother was in a critical health condition. But he never got home to see his ailing mother. He took off from Akure, but on reaching Ogwashukwu, the vehicle he was traveling in was stopped by officials of the National Drug Law Enforcement Agency(NDLEA). After a search on passengers, he was singled out of the vehicle. The NDLEA officials held him down, saying they were suspicion he was a criminal. Despite finding nothing drug-related on him, the NDLEA officials sent him back to Akure and handed him over to the State Security Service where he was detained. Mr. Ubaji, 33, recalled his painful ordeal, fighting back tears as he spoke to our correspondent. “They searched my bag thoroughly, they found nothing, but only my ID card of my membership of Movement for the Actualization of the Sovereign State of Biafra(MASSOB) and the drugs I bought for my sick mother. That is how they arrested me and detained me until the following day and from there they returned me to Akure and handed me over to the SSS,” he said. The State Security operatives dumped Mr. Ubaji in a cell, claiming they were investigating him. While in cell, he was tortured,and deprived of good food and medical care. Family members were also not allowed to reach him. As a result of maltreatment, he fell terribly ill and was at the point of death. “When they saw my condition and thought I was going to die, they decided to let me go,” he said. Mr. Ubaji was released on December 30, 2014, about a month and six days after he was first detained, and sent away away without his money and other belongings seized from him before his incarceration. “I went back several times to collect the money, which was N44,500 and other items, but instead of giving them back to me, they beat me and threatened to re-arrest me. “They said to me, ‘you are a MASSOB man and you are still coming here to ask for something, you better forget about them or you will find yourself in trouble,” he lamented. Mr. Ubaji has taken his case to the Office of the Public Defender, a department of the Ondo State Ministry of Justice that is concerned with helping the downtrodden, especially those being oppressed, get justice. The efforts of the Public Defender through petitions to the office of the SSS in the state has yet to yield any meaningful result. Its Director, and a legal practitioner, Deji Ogundare, said the security agency was even making further attempt to arrest Mr. Ubaji, whom they claimed belonged to an outlawed organisation. “We made efforts to seek protection for the man, who was detained for over one month, but the security organisation was becoming difficult, asking him to come to them and we know that it is another attempt to re-arrest him and detain him. “Our stand is if they thought they had anything against Mr. Ubaji, they should arraign him in the law court and not to detain him without trial, and if you cannot try him, then release him,” Mr. Ogundare said. He said efforts at getting the seized and other items released did not work because the SSS officials claimed they were keeping the money and other items as exhibit against Mr. Ubaji. Mr. Ubaji said he had to go into hiding for fear of being detained for another long period of time without any help. “As I speak to you, I am still battling with my health and i don’t think I will survive another attack,” he said. He said he wanted the SSS officials involved to be brought to book and his money and belongings released to him. “I am a MASSOB member. MASSOB is a law-abiding organisation. I have not done anything wrong and I don’t know why they are persecuting me because of my membership of MASSOB,” he said. Efforts to get the SSS officials in Ondo to respond were unsuccessful as they claimed they could not talk to the press, saying all enquiries must go to their Abuja Headquarters. At their Abuja headquarters, the spokesperson for the agency, Marilyn Ogar, did not answer or return calls seeking comment. She also did not respond to a text message sent to her.